Romeo and Juliet is undoubtedly the most famous love story of all time, featuring two ‘star crossed lovers’ whose brief but intense affair ends in tragedy. It is one of Shakespeare’s most popular plays, and both Romeo and Juliet have become archetypal young lovers, representing certain notions of masculine and feminine identity. How and why do writers construct such notions of gender identity? One way is through characterisation – the process of representing a fictional character in a text. We will use Romeo and Juliet to examine this concept before moving on to more modern popular magazine articles and media representations of masculinity and femininity. We will also learn how gender roles have changed across time and place. Session 1 – The Perfect Man/Woman? We begin the unit by brainstorming what our modern notions of ideal masculine / feminine identity are and thinking about what might have influenced these ideas. We will then research about gender roles in Elizabethan England and compare/contrast these with modern gender norms. Session 2 – Violence in Verona! Today is all about men trying to act tough – machismo! We will learn some more about historical context before diving into the rough and tumble beginning of Romeo and Juliet. At the heart of representation is characterisation. Today we will learn the STEAL model of characterisation analysis and apply it to members of the Capulet family to examine notions of femininity. The language we use says a lot about our personality. Today we explore this idea by examining Romeo and Juliet’s first meeting – and it is love at first sight! Today we explore the most iconic scene in all of theatre – the balcony scene! We will examine Romeo and Juliet’s use of language and seek to understand how language reveals our thoughts and personalities. We will also learn to write analytically. Would you marry someone you had just met? In this session, we get to go to a wedding! (Albeit a hasty one…) Also, we explore the importance of character motivation in literature: why do characters say and do the things they do? Session 7 – Trial of Tragedy! Romeo and Juliet is a tragedy, and so things can’t stay rosy for too long! Act 3 begins with the deaths of some major characters, but who is responsible? Today we will practise the ’cause and effect’ reading skill, figure out what caused the tragic events, and hold a mock trial to share our arguments. Session 8 – Roles Reversed? As we finish Act 3 we begin to see how various characters ‘act like’ typical men and women or subvert stereotypical gender norms. 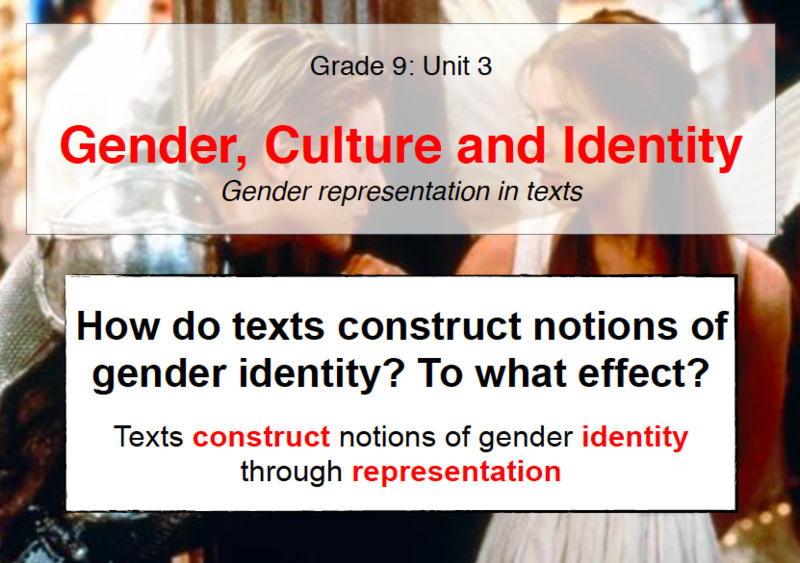 This lesson is about examining how characters are represented as conforming to, or deviating from, traditional notions of gender identity. Session 9 – EmPOWERed Essays! Beginning academic essays can be a daunting task. Today we will learn to use the EmPOWER strategy to make the process much easier! We will begin our first summative task – the analytical essay. We take some time out from the play to revise and improve our essay knowledge and skills. We will focus on content, audience, purpose, structure, language, using evidence, and style/language use. We will apply our knowledge by editing our essays. Modern mass media texts also construct notions of identity through representation. We will explore this idea by creating our own creative written task about a character from the play. We will read and deconstruct example articles before creating our own. Today we will revise and prepare for the upcoming exam, which is a literary analysis essay in response to an unseen passage. Isn’t it bad luck to end on the number 13? Oh well, I guess it would be in keeping with the tragic theme of the play! Today we wrap up the unit by reflecting on our learning. No Fear Shakespeare – The play reproduced with easy to understand text side-by-side with the original. Resource folder: All my resources will be placed here.